Richard Cordray, candidate for Governor of Ohio, speaks with The Lima News editorial board on Friday. 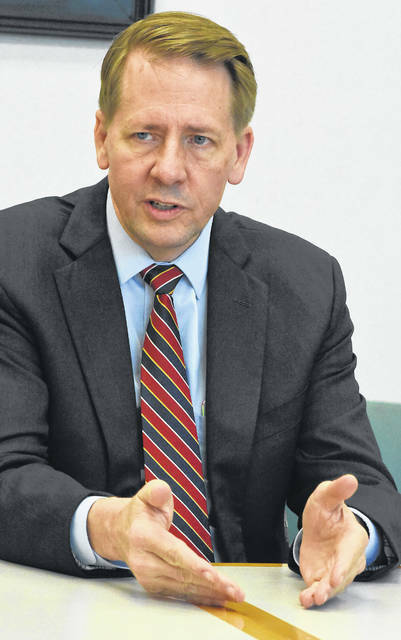 Cordray met with The Lima News on Friday. 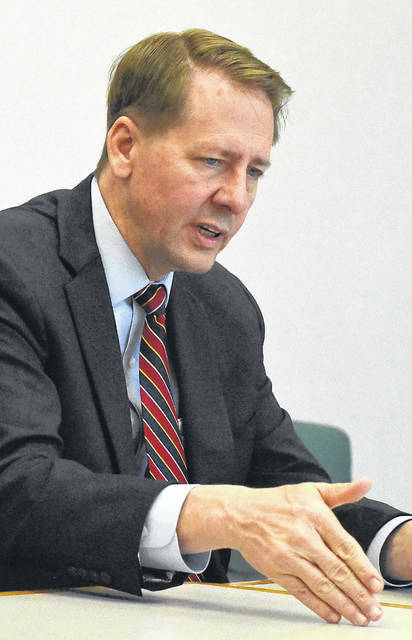 LIMA — The Democratic candidate for Ohio Governor, Richard Cordray, sat down with The Lima News editorial board Friday to discuss a variety of issues. Cordray says the economy remains the biggest concern of Ohioans. “Even though the economy is good in some respects, unemployment is relatively low and the stock market has been high, they have a lot of economic anxiety and wages have been flat for a long time and costs continue to rise, so they’re concerned about health care and having somebody who will push to keep health care costs down and coverage, make sure it’s reliable. They’re concerned about having the skills and training that they and their children and grandchildren need to compete in the workplace,” said Cordray. With only a few more days to go before the Nov. 6 election, Cordray was critical of his opponent, Republican Mike DeWine, over increasingly negative campaign advertisements. “I have not talked at all about raising any new taxes. This is just a political talking point that they’re running now that the rest of their negative ads haven’t been working as well as they hoped. It is notable that after 42 years in politics, Mike DeWine’s almost entire campaign is a negative campaign. He doesn’t even have a record he can run on after 42 years, and that tells you something,” said Cordray. Cordray would also like to see changes in drawing up legislative borders in Ohio. “We shouldn’t be cramming down an opposite partisan gerrymander. What we need to do is have some number of competitive districts where voters will really be able to decide in the fall because then you’ll get the candidates from both parties having to move closer to one another and compete for the general election voters. That’s what we haven’t had for years in Ohio. Honestly, we’re a 50-50 state but we have a 12-4 congressional delegation, 66-33, 12-9 in the House and the Senate. That’s an unaccountable system, where people only have to worry about a primary challenge and therefore both sides, they flow towards the extremes,” said Cordray. Many wind power projects have been put on hold due to the state legislature enacting tougher setbacks on where the wind turbines could be located. Recently, companies have pulled out of projects in both Van Wert and Mercer counties. Cordray would like to make Ohio more alternative energy friendly. “I’m in favor of clean renewable energy, and I’m in favor of wind and solar — and by the way, the entire rest of the country and the world is in favor of it, and it’s creating a lot of jobs in places that look forward on it. We had that setback legislation that got rammed into a bill with no hearings at the last minute, and it has completely set back the wind industry in Ohio for the last couple of years. That needs to be fixed and we need to move forward with wind and solar. “It’s other kinds of companies, too. The technology companies are looking around the country, and Amazon’s made it clear they want to be in a state where they have dependable energy costs over the long-term and they see that as renewables because renewables, unlike extractive industries, it doesn’t get worse or more expensive to dig down and get things out. It is replicable over the long-term and it’s not just tech companies but General Motors, a lot of the Fortune 500 companies, because of shareholder pressure or because of employee work base pressure, people, want as a point of principle to see that you’re a having more sustainable footprint so they want to locate in places where the state has a commitment to clean renewable energy,” said Cordray.